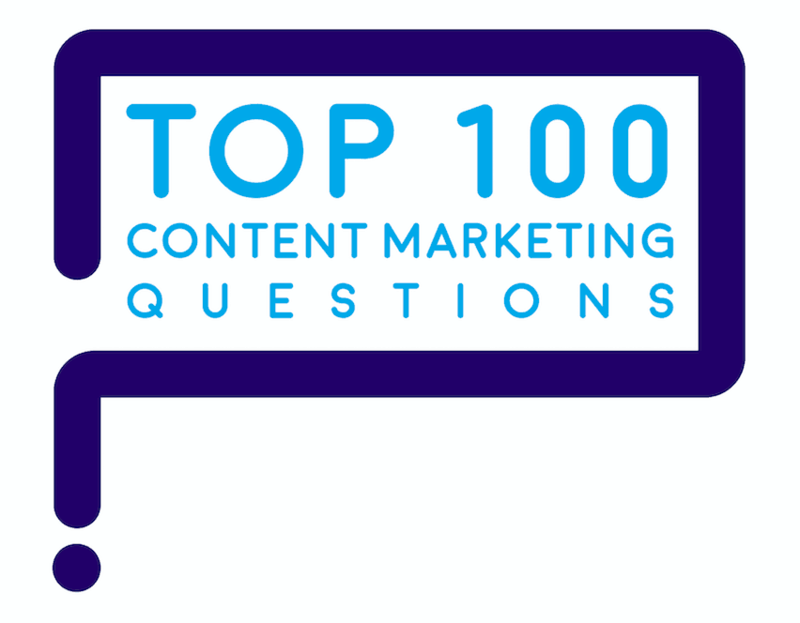 “How do you continue to engage your audience?” is one of marketers’ top 100 questions about content marketing. Once you identify an audience’s needs and start to publish relevant content, how do you engage your audience in content marketing? 1. Evoke an emotional response. 2. Keep content newsy and fresh. Messages and content that evoke emotional responses, by definition, engage your audience. That’s one reason that picture- and video-oriented social media are on the rise. A new social media study by Edison Research found that Facebook usage declined slightly from 2017 to 2018. Where’s the growth in social media? In image-based networks like Snapchat and Instagram, says The Infinite Dial study by Edison Research — especially for younger audiences. 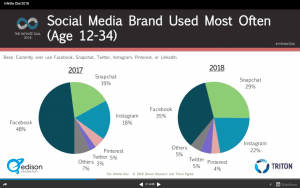 Visual social media like Snapchat and Instagram are gaining share, as Facebook slides. Visual is the new headline! Many images evoke an instant emotional response. The right text evokes emotion too. For example, flatter your buyers: show them how much they know about the topic already. Provoke a response by expressing a strong opinion, especially in social media. Think about it: The President is able to shape the news cycle with one provocative Tweet in the morning. In B2B, Tim Washer uses humor intelligently. He always cracks me up. Laughter works. Why? Because it lowers peoples’ defenses. And opens them up to new possibilities. To draw in your audience, don’t make all your content a one-way street. Go for back and forth. Make it easy to share your website, social media and email content with others. Use tools that enable one-button sharing. Draw people in with contests and prizes for participants. Offer quizzes and surveys that are quick and compelling. Offer evaluations and benchmarking so customers can see how they stack up compared with their peers. Provide assessments to help customers gain insights into their own behavior. One of my favorite assessments is Sally Hogshead’s personality test on how others see you. Once a paid assessment, it’s now free on her website. It’s useful and fascinating. Enable and encourage user-generated content. These examples of user-generated content inspire me. In the Netherlands, the car brand Opel is offering a free car to anyone who makes a YouTube video about Opel that generates 589,000 views. 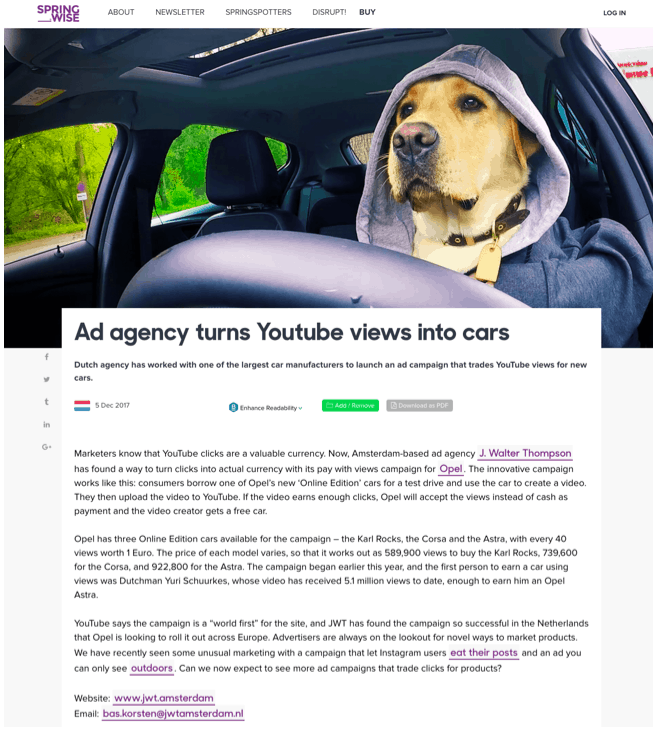 Create a video for Opel, gain enough views, and they’ll give you a new car! Perhaps my favorite user-generated content of all time: the #NZdronie. Tourism New Zealand got 34 million people involved in this user-generated content. 3. Keep content newsy and fresh. Use today’s news to keep your content fresh. How? Monitor news about your audience, your industry, your products and your competitors. Comment on it in a timely way — within hours of the news breaking. Your PR team may use a news monitoring service. Ask if you can tap into it to monitor today’s stories and up-to-the-minute news. Or use news.google.com to get alerts to you about the topics of your choice. Confer authority on a content editor to quickly share and react to today’s news. 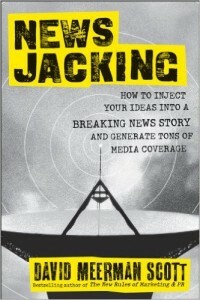 This practice is known as newsjacking, named for the David Meerman Scott book. The half-life of news is only a couple of hours. If you don’t get into the conversation quickly, no one may ever notice what your company had to say. Recently I Tweeted an alarming story on fake news, adding my own commentary “Twitter Flunks the Lie Detector Test” to an Atlantic magazine headline “The Grim Conclusions of the Largest-Ever Study of Fake News.” About 150 people, or 1.5% of my followers, clicked on that Tweet – not bad. To newsjack effectively, it’s crucial to map out your company’s message in advance. Doing so means that you can stay on safe ground as you get into news conversations. To define what you can say and can’t say, use your company’s Message Map to stay on message. Get your legal department to buy into the Message Map in advance, so news curators or editors can make timely decisions while the news is still news. Beyond the news stories your company already generates, add content that buyers will crave. 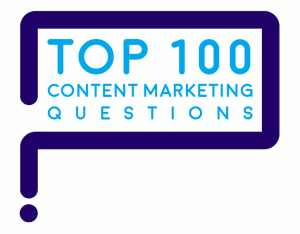 Here are 3 questions to help you generate thought-provoking content. What is the one question that no one in my industry will answer? What is the one accepted idea in my industry that lacks evidence? What is the one industry trend that no one sees coming, which would keep our customers up at night? Generate news by doing surveys at industry trade shows and events. People love to see how their opinions compare with others in their industry. Turn around the results from a first-day survey overnight and publish results on the morning of the second day. Whenever you generate a news release, advance your content marketing by including a bulleted list of related content assets in paragraph 2 of the release. That’s where to put links to content assets such as videos, infographics, podcasts, executive summaries, photos and so forth. Remember: your news release will probably reach customers and employees more than journalists. Most journalists don’t have enough time to monitor the news release stream. Borrow interest from in-vogue topics or brands. Tie in your content marketing with the latest movie release, sports events, or something else that’s a topic of conversation right now. This is one of 10 ideas from a study of what makes the most compelling B2B content. How could you inspire, incent and encourage your users to generate content for your brand?